Project Project: A special ornament. We have made it a North family tradition to buy something new and special for the tree each year. When we were just starting out and didn't have much holiday decorations, it was often bigger things like a box of ornaments or a tree skirt one year, or spools of ribbon another year. Now we're not so worried about having enough to simply cover the tree, and can focus on finding something really pretty or meaningful each year. 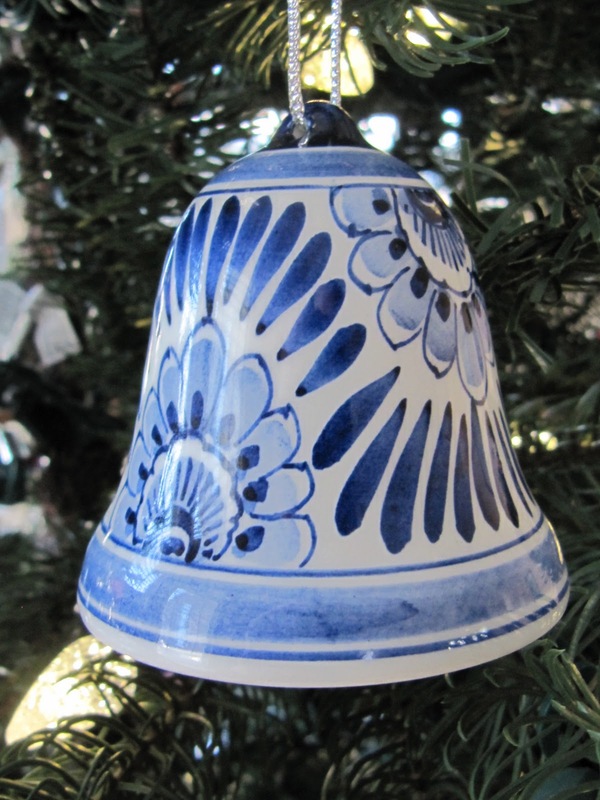 This year's special ornament is a hand painted Delftware bell that we bought in Delft this summer while we were visiting Nick's sister Tess in the Netherlands. (Tess, why did you stop blogging?) We bought it in a little store on the square, where the owner was painting pottery in the store. She was friendly and endlessly patient with Espen, who wanted to touch everything. Bull in a china shop? Pshaw! Try a bored toddler. Sitting here in my living room and looking up at tree, I am reminded of so much about that day, it's almost like being transported there in my mind, right up to regretting all over again not buying some of those silly wooden tulips they sold to tourists everywhere you turned. My hope is that, years from now, our whole tree will be filled with things that bring back memories of places we've been, people we love and the wonderful things we have done. What do you love about your Christmas tree? Also, don't forget to enter my current giveaway from Sage Digital Designs! If not for Christmas cards this year, then maybe for an upcoming holiday or event next year! Show off that beautiful little family/dog/cat/face of yours! :) Enter here. Because I Earl 40hrs a week on a computer and just want to avoid my lappy when I'm home. Though, I really do miss it! Also, oh so happy to share this memory with you!!! I love collecting Christmas clutter, because you can enjoy it for a while and then put it away! Love the blue Delft! What a perfect keepsake of your trip! Growing up, my mom made it a tradition to get my siblings and me an ornament each year, and when we were grown, we had a box full to take and use to decorate our own trees! I hope you new ornament will continue to remind you of your trip for years to come!